Raza Khan is one of the most amazing singers I’ve heard in my life. Truly. "one of the most amazing singers I’ve heard in my life"
I’ve heard technically excellent singers before. I’ve been moved by impassioned singers before. I’ve been cleansed by deeply spiritual singers before. I’ve been transmuted by the experience of listening to singers who embody all of those qualities before; but never to such an alarming degree as I have to the voice of India’s Raza Khan. Raza Khan is a Sufi singer of qawwalis (spiritual songs that attempt to channel the divine that exists within us by communing with God). He comes from the Indian Punjab and was brought up from the age of 7 in the musical schooling of Sham Chourasi Gharana, a 500 year old musical tradition, under the tutorship of Ustad Shafqat Ali Khan. "an astounding range of registers"
As with the world’s most legendary Sufi singer - the late Nusrat Fateh Ali Khan - Raza Khan performs supported by a ‘party’, a group of accompanying musicians, who sit round him and play instruments, clap and sing and set up the musical framework that he then sculpts with his voice. A voice that is capable of operating in an astounding range of registers, mimicking the entire range of his harmonium and more. "had me gasping for air"
I’d only heard him on CD before, which was impressive enough, but it was seeing and hearing him perform live at Womex 2012 (the largest gathering of world music professionals on the planet) that had me gasping for air and having to almost pop my eyeballs back in. Since I don’t understand the intricacies of the music or the languages it is sung in, I can only write at an emotional level. The concert, held in the Vellidis Theatre at the Helexpo Centre in the Greek city of Thessaloniki, was slightly delayed as the previous performance (by an Egyptian singer) held in the next door hall had overrun and Khan’s party had to stand on stage and wait awkwardly until they could take their places seated cross-legged on the special raised platform on the stage. The party consisted of three men whose job throughout was to maintain the tempo and build the trance by clapping, a tabla player (the paired drums of the North Indian sub-continent), a singer and a harmonium player who also sang. As the dying notes of the Egyptian band died away, Raza Khan came on to polite applause and sat down in the midst of his party (all students of his) in front of his own harmonium. Qawwali music tends to take many minutes to settle in as we gradually align our bodies to the rhythm of the tabla and the relentless claps, whilst the harmonium swirls around, gently playing with the melody and Raza Khan explores the theme with his voice, almost toying with it, prodding and poking, stroking and shaking the tune and the words, investigating it from different angles. The claps continue and the trance deepens. Khan starts to play around with musical stops and gaps. People start to applaud thinking the song is over, but like synchronised divers leaping off the top board, the musicians land back in the beat bang on cue. By the third or fourth stop people have learnt not to clap and sit through the tension and wait for the release. There’s a lot of humour in the performance - which might seem strange at first since there’s an obvious deep sense of respect for the tradition and for the spirituality of the occasion, however humour there is. Khan plays with the dynamics and the sounds he can produce with his voice, from soft susurrations to excitable yelps. He constantly moulds and changes the density, the texture and the tone of the music that he creates. There is a high degree of improvisation and musical impulse in this performance. He is clearly moving the tune along as his soul dictates in the instant and his accompanying students are keenly tuned into his nuances. You begin to understand that he has probably never played a song the same way twice in his life. Every time you think you’ve got the measure of what he’s doing, he turns it upside down and shows you another aspect of the song. After a few minutes one of the accompanying singers takes over from Khan for a short while, with a voice that sounds unnaturally high and stark, and the same song takes on a different hue. We hear the melody with different ears. He stops and Khan takes up the theme again. I am already entering into the trance, being carried away by the music, really enjoying how his voice constantly changes form like a kaleidoscope, but I am not at all prepared for what happens next. Khan thickens his sound almost physically and then suddenly changes direction and accelerates the pitch of his voice upwards, flying off into the stratosphere! Whoa!! What just happened there? In classic cartoon style, my lower jaw drops open, my eyes push forward and all the breath leaves my body. "Khan is on the direct line to his God by this time, his face wild with passion"
This man can do almost anything with his voice! He can bend and micro-pitch notes with uncanny ability - it’s truly bewitching. His arm reaches out to the audience questioning, yearning, imploring. We are spellbound. Khan is on the direct line to his God by this time, his face wild with passion. His head shakes and an unruly strand of hair whips about in front of his face. He takes his screams to great heights of intensity and then at the last moment throws them behind himself for his co-singers to echo, take up and embroider. And the other two singers, his students, are worthy of going to see on their own. Each one has their own distinct vocal characteristics in terms of pitch and tone that allows them to shine their own light on the intricacies and possibilities of the song. 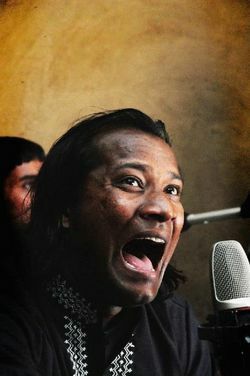 As a foil to Khan’s vocal acrobatics they serve to push him, and each other, higher and higher as they swap and echo phrases and trade patterns, playing catch-ball with each other, the tabla, the harmonium, the clappers and even themselves, building the song with true religious ecstasy. The massed backing vocals of his party when they finally kick in are intense, dramatic and overwhelming. It is as multi-faceted as a rock crystal and every bit as sharp and precious. Like gymnasts or astronauts Raza and his students push their vocal abilities to the very limits of physical endurance, experimenting with sound in the service of spiritual expression and religious devotion. They can go from sweet and melodic, to low and hypnotic, and from there in an instant to amazingly high registers that fill your head with images of anything from old women and yowling cats to crying babies in a split-second before rocketing off to turn into a sweet mountain breeze or a multi-harmonic tropical storm. Does that put you off? Then don’t let it! These are supernatural voices, truly otherworldly. I would urge you, if you get a chance to hear them in this life, then do it! The trick with this music, especially if you are not used to qawwali, is to come to it with no expectations really. Don’t try and understand it, just allow it into your ears and through your body. If it reaches your soul, you know you’ve arrived. But to experience it live is the best way by far.